Learn Italian in Taormina at our partner school Babilonia. Babilonia just recently opened up their school in a fantastic new location, which is via the Timoleone 10, the beautiful staircase which is leading up to the Greek theatre, in a stunning patrician 19th Century villa surrounded by botanical gardens thus making it an ideal location to learn Italian in. The language school also is a cultural centre which organises presentations with writers, paining and art exhibitions, jazz and classical musical concerts and has a cafeteria and restaurant open all day long serving tasty traditional Sicilian dishes. This is not only a great place to learn Italian but also meet both students and local Italians in Taormina! The intensive course is designed for those who want a complete language experience. You can choose the intensity of your course by choosing 10, 20 or 30 lessons per week. The course is available for all levels and the minimum duration is one week. A double room can only be booked by 2 people who travel together. This prices is valid for an aiport transfer on arrival at Catania airport. From mid May to mid October, the maximum number of students is 12. During the rest of the year the maximum is 10. The school closes on December 13th, 2019 (last school day) and re-opens on Monday, Jan, 13th, 2020. The combined course is designed for those who, beyond the advantages of the intensive group course, want to have an extra individual hour (one-to-one) especially devoted to their individual language needs. It is possible to attend an extra course (diving, cookery, etc.) instead of having one-to-one lessons. Prices on request. Moreover, the extra course can be booked for a shorter period of time than the language course. Young at heart? The golden age course is specifically geared towards students over 50 who want to study a language and at the same time learn more about Sicily; not only the history, culture and society of Sicily, but also the cooking, food and wine. It's the perfect way to enjoy your leisure time whilst socialising with others of a similar age. Language classes take place in the morning, with a whole range of cultural activities and excursions following on in the afternoons and evenings. A typical programme may include trips to a museum or show, extra classes of cooking or pottery or golf, and visits to nearby cities, beaches or countryside. Minimum age is 50 years . The Golden Age course includes an activity and excursion programme. The Golden Age program is open to absolute beginners too, but then you will have your classes with the regular absolute beginners students. The social, cultural, leisure program will be run mostly in Italian, some English might be used only to summarize the content of the activities or guided tours. In combination with your intensive course of 10 or 20 lessons a week, the school organises a practial apprenticeship on pottery. There are 3 workshops of 1.5 hours per week tutored by professional craftsmen. Minimum level of Italian required: Intermediate. This course combines an intensive course with 10 or 20 lessons per week with a gastronomy course. Sicily has an extraordinary production of excellent wines, oils and cheeses. Come and get to know more about them with a personal experience. The gastronomy course includes tasting and explications about origins, production, and recepies! 3 lessons of 1 hour and a half per week included. Intermediate level required. In combination with an intensive course of 10 or 20 lessons, the school organises a practial apprenticeship on wooden furniture restoration. There are 3 workshops of 1.5 hours per week tutored by professional craftsmen. Minimum level of Italian required: Intermediate. This course combines an intensive course with 10 or 20 lessons per week with a history of art course. The history of art course consists of 20 hours over two weeks. You will learn about sculpture, painting and architecture in Italy from the prehistoric to the present day. Minimum level of Italian required: Intermediate. This course combines an intensive course with 10 or 20 lessons per week with a cookery course. The Italian cookery course is being thought at the school´s kitchen and consists of 3 afternoons a week. You will learn how to prepare typical Italian and Sicilian dishes. Each lesson is 3 and half hour. An intermediate level is required. This course combines an intensive course with 10 or 20 lessons per week with a history course of 10 hours per week for 2 weeks. You will learn all about Italian history, from the prehistory to the present day. Intermediate level required. This course combines an intensive course with 10 or 20 lessons per week with a literature course of 20 hours spread over two weeks. You will learn about Italian literature form its origin to the present day. Intermediate level required. The objective of the duo course is to create a programme adapted to the student's level and learning pace. You can choose between 15 and 20 lessons per week. The duo course is a course for two students. This course can only be booked by two people who travel together and have the same level of Italian. It is a class for two students. This course can only be booked by two people who travel together and have the same level of Italian. The one-to-one course is designed and arranged on a individual basis to meet your needs. The prefect choice for people who don´t have much time, but want to learn as much as possible. 15 or 20 lessons per week. 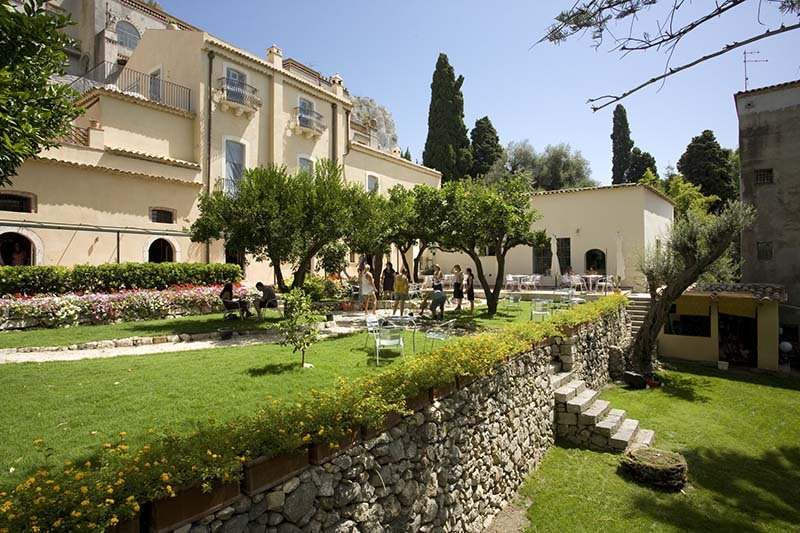 The school offers shared apartments throughout Taormina with single and double rooms. Shared apartments have a communal kitchen and bathroom(s). We recommend shared apartments as a great way to facilitate social / personal interactions with fellow students. Available with single or double rooms, we have a limited number of families, couples and single adults who make available rooms in their residence. Many are available with boarding options (meals), which include breakfast only, half board (breakfast & lunch or dinner) or full board (breakfast & lunch & dinner). Obviously this accommodation option requires a greater commitment not only on the part of the property owner, but also on the part of the student. It is well suited to those who want a more intensive learning esperience and additional daily practice speaking Italian. In a single use apartment you don't have to share the facilities with other students. This is the perfect option for those students who want privacy and complete independence. The city is lovely. The apartments are big. There are lots of opportunities for practising oral and listening but less focus on grammar. Stay at least two weeks is a must.